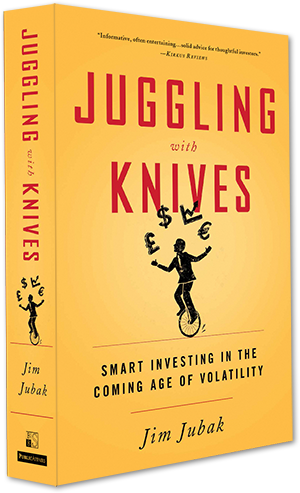 Every post on Juggling With Knives – that’s 2 to 3 posts on most days, and on most days that includes a special post on volatility and how to survive and profit from it. Receive Jim’s daily email alerts that put every post from Juggling With Knives straight into your mailbox at 8 p.m. Eastern time. Full Access to all Jim’s buy/sells/updates and to his three established portfolios JubakPicks, 50 Stocks, and Dividends – plus access to his new Volatility portfolio begun in January. Occasional special features posted from Jim’s $199 website Jubak Asset Management (JubakAM.com) whenever market conditions require. Subscribe and you can view everything on the Juggling With Knives website. (If you’ve purchased the book, you’ve earned a one year free subscription. Use the Coupon Code in the book to start your FREE subscription). Are you already registered on the website? If you’ve already registered, click the Login Button below, or use the Lost Password Button with the email address where you already receive the Juggling With Knives emails.